The Park City Food & Wine Classic, the premier annual food-and-wine event in Park City, takes place this year on Thursday, July 7, through Sunday, July 10, at various Park City locations. Among the attractions are outdoor activities with chefs and winemakers, wine-tasting seminars, the popular Stroll of Park City and Grand Tasting and much more. New at this year’s Food & Wine Classic is an opportunity to increase your wine IQ with The Court of Master Sommelier’s Introductory Sommelier Course, held July 11-12 at Deer Valley’s Montage Resort. This is a first for Utah. The intention of the introductory sommelier course is to provide attendees with well-rounded beverage expertise following The Court’s rigorous standards. It’s a two-day educational course ending with a multiple-choice theory examination on the second day. Candidates learn by reading, tasting and practicing service techniques. The cost for the course and exam is $495, plus a $25 syllabus fee. Of course, many of us have no intention of becoming professionals in the wine industry; we just want to sip some good vino. The first opportunity for that is the Wine on the Mountain kickoff celebration ($125) on the evening of Thursday, July 7, at the St. Regis Deer Valley. Guests will meet and mingle with winemakers, sample wines from around the world and be treated to food pairings from Jean-Georges Vongerichten’s signature J&G Grill. On Friday, active winos can join Stein Eriksen Lodge executive Chef Zane Holmquist as he hosts Mud, Sweat & Cheers, a mountain biking, food and wine seminar. After a scenic ride led by chef Zane, attendees will enjoy a scrumptious luncheon paired with wines from Fisher Vineyards. Chairlift ride, bike jersey, food and wine are included in the $90 fee. 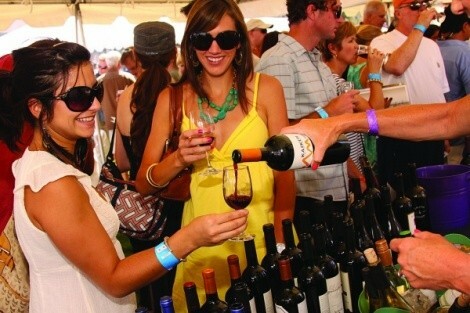 If you’d rather walk than bike, you’ll be interested in the Stroll of Park City Grand Tasting ($70). Wander Park City’s Main Street while enjoying small plates provided by local restaurants and wine samples from the wineries in attendance. For something a little more exotic, Savory Sundowners & Iron Pots ($65) also takes place on Friday, at the St. Regis. “Let’s meet up for sundowners!” is a phrase heard in South Africa, beckoning the cocktail hour. At this event, Jane Lee Winter—executive chef of Gourmet Travel Club and a renowned safari leader—will host a cocktail hour with small bites cooked in iron pots. South African wines will be featured, and guests will receive a kitchen-tool gift. Proceeds benefit the People’s Health Clinic. Saturday’s featured wine seminars will be held at Canyons’ Westgate Lodge and include a course on Component Tasting ($40) where you can learn to identify tannin, acidity, alcohol, sweetness and more in wine. The biggest event of the Park City Food & Wine Classic is inevitably the Toast of Park City Grand Tasting ($90), held in The Forum at Canyons. At the Grand Tasting, attendees sample food, wine, beer and spirits from more than a hundred different purveyors from around the globe. My only advice: Pace yourself. The 2011 Park City Food & Wine Classic wraps up on Sunday with the High West Beerunch ($35), a brunch held at High West Distillery & Saloon featuring tastings of High West’s award-winning whiskeys and more. For detailed information on Park City Food & Wine Classic events and to purchase advance tickets, visit ParkCityFoodAndWineClassic.com. Special ticket packages and lodging deals are also available, as are discounted designated driver/pregnancy passes for those not imbibing.